This latest router series includes support for professional features such as VLAN tagging, Gigabit Ethernet, built-in wireless LAN. It also includes support for other professional features such as VLAN tagging, QoS (Quality of Service Assurance), High Availability, DNS Filter, Policy Based Routing, and User Access Control. Wired and Wireless models also include the new Hotspot features. 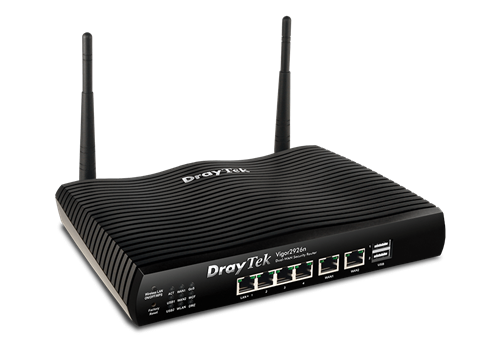 If you deploy DrayTek Wireless Access Points, the Vigor2926N can act as the Central Management Controller. A 5-port Gigabit Ethernet switch on the LAN side of the Vigor 2926N provides high speed connectivity for your server, other local PCs or for uplink to a larger Ethernet switch. Comprehensive security features include content filtering, web application controls and an object based firewall management system. Port 5 is switchable with 'WAN2' to use it as an Ethernet WAN port instead of a LAN port.